The Virginia Museum of History & Culture launched Unknown No Longer in 2011 to make accessible biographical details of enslaved Virginians from unpublished historical records in its collections. 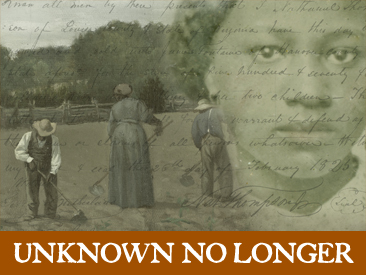 At the beginning of 2019, the unique content of Unknown No Longer was moved to be hosted on the Virginia Untold portal operated by the Library of Virginia, providing users with access to an expanded collection of resources for researching African American history in Virginia. Researchers can still access the original documents in the VMHC's library, and we will continue to update both the Unknown No Longer database and our Guide to African American Manuscripts as new sources enter our catalog.